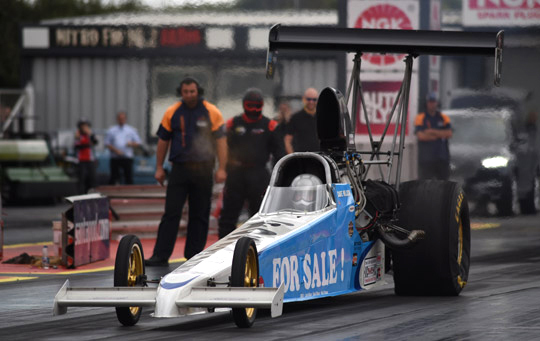 An all Habermann final is always close and the European Finals Top Methanol Dragster final was no exception as Dennis defeated his brother Timo on a hole shot to take the win. Because the Habermann brothers ran a part time programme this season, last year’s numbers one and two in the championship were no threat for championship leader Jonny Lagg. The Swede secured his first FIA European TMD title even before qualifying as his nearest rival, Chris Polidano, had to withdraw his entry. With the Maltese driver missing, Timo and Dennis Habermann ended the 2016 championship in second and third position. 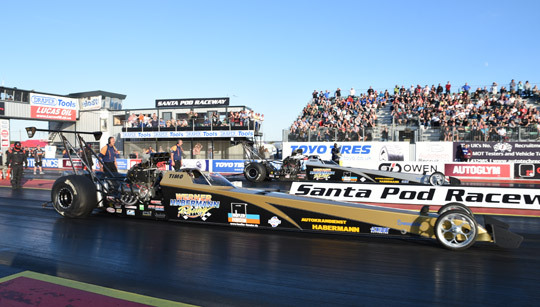 With seven entrants, Top Methanol Dragster had the biggest field of the 2016 season at Santa Pod. As Chris Polidano was 100 points behind leader Jonny Lagg, qualifying was enough for the Swede to clinch his first FIA European TMD title. But even that was not necessary anymore when the Maltese driver had to withdraw his entry and so even before making one run, Lagg was crowned as the 2016 champion. With the forecast of a rain out on Saturday, the teams knew they had to set their time on Friday. Timo Habermann impressed with 5.33 seconds on his first run of the day, while his brother Dennis was the most consistent of all drivers with two 5.43 second runs, claiming the number two qualifying position. Lagg and Dave Wilson changed positions after run number two and ended qualifying in third and fourth. 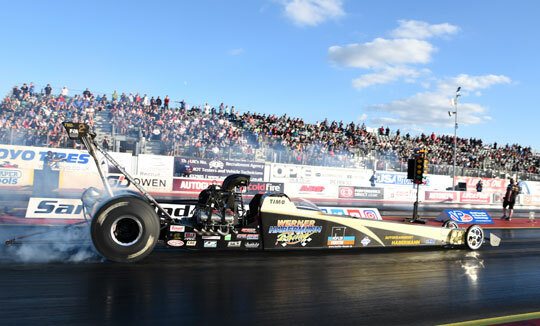 Rod Harrison ran 5.91 seconds on his second run to end qualifying in fifth position. 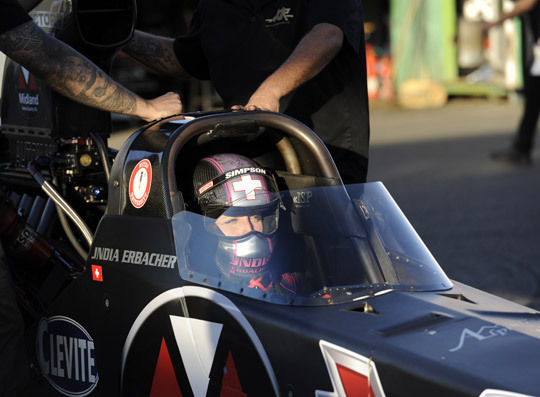 On her second run Jndia Erbacher improved one second on her earlier Friday performance, but with 5.94 seconds the Swiss racer was the number six qualifier and had to face Timo Habermann in the first round. 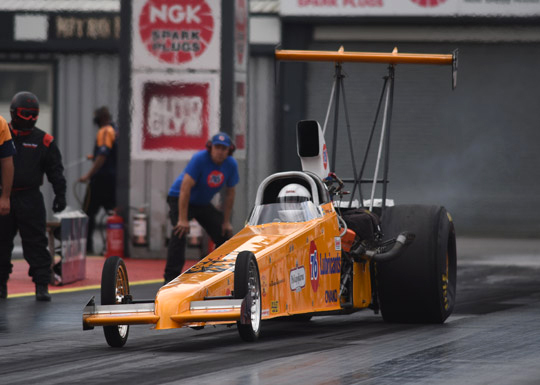 Erbacher improved once again on her earlier performance by half a second, but the 5.54 seconds was not enough to stop Timo Habermann’s better reaction time and 5.34 seconds elapsed time. 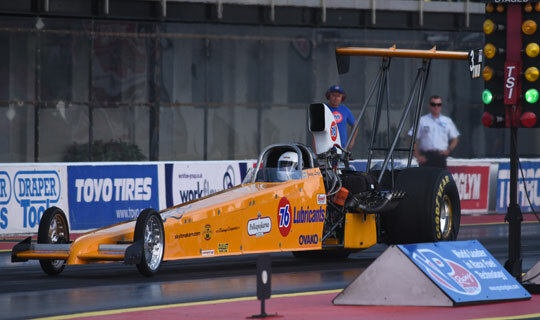 Dennis Habermann couldn’t match his Friday qualifying elapsed time, but the 5.65 seconds was enough to beat Harrison. The quarter final was also the last run of the season for Lagg, as the 2016 FIA TMD champion was defeated by good old Wilson. 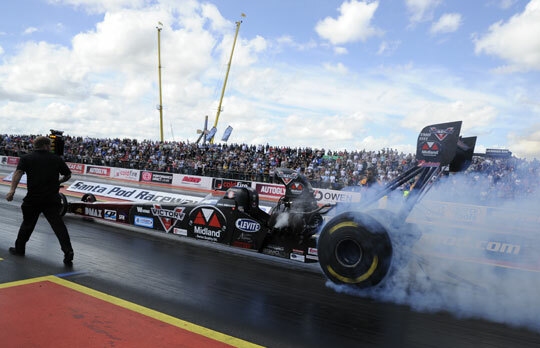 With both cars in the race and a limited time between the semi-final and final, the Habermann team made the decision to let Timo cruise to the finish line in his bye run. Dennis Habermann had to race for his place in the final as the 2015 FIA TMD champion had to face Wilson. 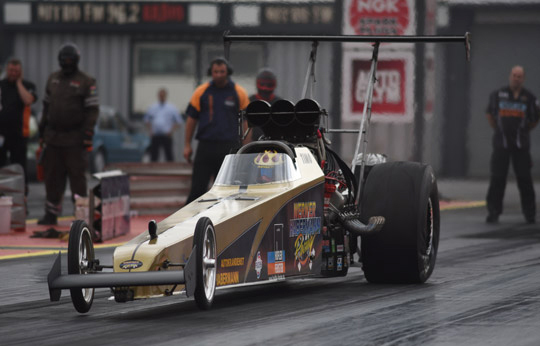 The young German improved to 5.40 seconds and as Wilson slowed down a bit at the top end and recorded 5.83 seconds, the final was once again an all Habermann family affair. A final with the two Habermann brothers is always close, as both have great reaction times and can almost run identical elapsed times. The 2016 European Finals final was no exception to that rule. 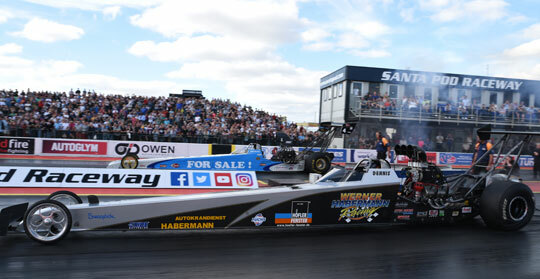 With 5.305 seconds Timo Habermann stormed to the low ET of the event, while Dennis Habermann improved to 5.32 seconds, his best ET of the weekend. 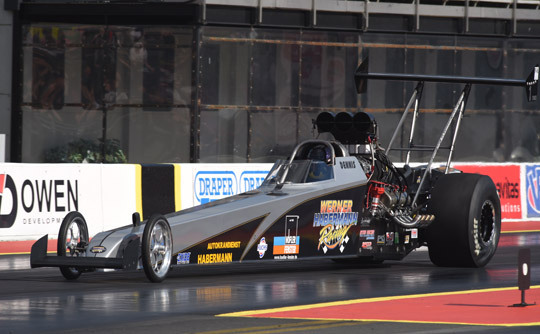 But with a 0.032 seconds better reaction time, Dennis took the win on a hole shot by 0.017 seconds. 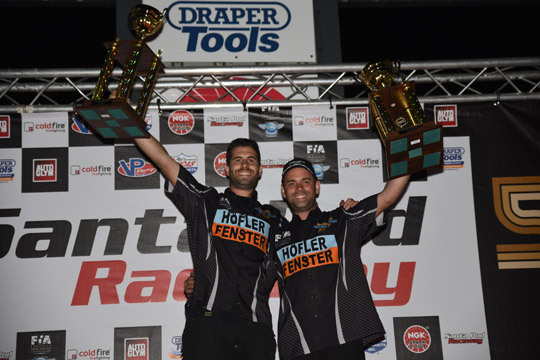 With Timo winning the NitrOlympX and Dennis the European Finals, Werner Habermann Racing won both races they attended this season. 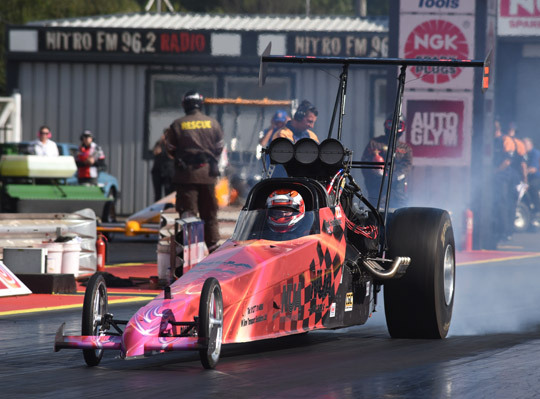 Lagg is the 2016 FIA European Top Methanol Dragster champion and the Swede deserved it as he took part in all FIA events where TMD raced this season. With their Euro Finals results Timo and Dennis Habermann jumped over Polidano to take the second and third position in the championship.